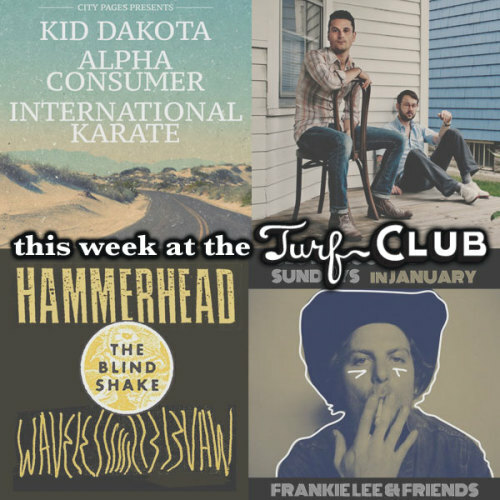 The Turf Club will be going out of 2014 with a bang. A triple bill of incredible locally based musicians tonight, with Kid Dakota, Alpha Consumer and International Karate sharing the stage. Kid Dakota, otherwise known as Darren Jackson, gained much prominence when local legend Alan Sparhawk discovered his first EP in 2000, and released it under his own Chairkickers Union label, expanding it into a full-length. He has since released three albums here in Minneapolis. He will be joined by local trio Alpha Consumer, who has more experience than possibly any group in the Twin Cities. With their latest album, Meat, being released earlier this year, topping several local year-end lists for its tenacious and precise guitar riffs accompanied by singer and superb guitarist Jeremy Ylvisaker (The Cloak Ox, Andrew Bird, Dosh). Tommy Rehbein, otherwise known as International Karate, will be also headlining, bringing his dream-noise rock to the Turf Club stage for the first time. Following some of the best local rock bands on Tuesday, the Turf will be hosting the best of Minneapolis electronic groups both in one night, with Ryan Olson’s led Poliça project, fronted by icy-tuned singer Channy Leanagh of Gayngs. Through creative and experimental voice manipulation, the soundscapes, featuring two live drummers, and Leanagh’s soft voice work beautifully in unison, proven on their breakout critically acclaimed 2012 release, Give You The Ghost. Joining will be the experimental collective, Marijuana Deathsquads, who’s synth and vocal work can put a listener onto a completely different planet just seconds into any track. Their highly reverbed vocals are led by various local artists, including Ryan Olson, P.O.S., Isaac Gale and others, it is no surprise this show sold out as early as it did. Catch them both as the last show of 2014 at the Turf! Based out of Eau Claire and Minneapolis, basement rockers Peter Pisano and Brian Moen are the duo that make up Peter Wolf Crier. Local listeners have been waiting anxiously for the follow up album to 2010’s Inter-Be and 2011's Garden of Arms. Their large fanbase in the Midwest has enjoyed their progressive work with simple-style rock rhythms, working to be not just another “band that sounds like Trampled By Turtles”. They’re an incredible live show and hopefully will be answering some questions regarding their highly anticipated next album. See you at the Turf this Friday! The legendary Fargo-born, Minneapolis-based band Hammerhead will be performing at the Turf this Saturday night! The noise rock group consisting of former Vaz members Paul Erickson, Jeff Mooridian and Paul Sanders hit it big with their album Duh the Big City, followed by a breakup of the band. In 2010 the band members reunited for their Memory Hole EP and have been spotted from time to time on bills, but very rarely. Here’s your chance to see this highly influential Minneapolis rock group in the venerable Turf! Frankie Lee will be entertaining the crowd in the infamous Clown Lounge every Sunday this January, stop on by, because for only five dollars it is possible to catch one of the most celebrated folk artists in the Twin Cities currently performing. His weary alternative country tunes will make anyone shed a tear, filling the breaks with lyrics containing heartbreak, loneliness, and the drag of city life. Don’t miss this heartfelt songs of local Frankie Lee every Sunday this month! Movie screeners Trash Film Debauchery will be hosting Masters of the Universe for free this Monday night in the Clown Lounge! Come grab some food from our new kitchen and a drink for this NO COVER movie event!